Eaarth: Making a Life on a Tough New Planet [Audiobook Review] – my books. my life. Eaarth is equal parts terrifying and hopeful. 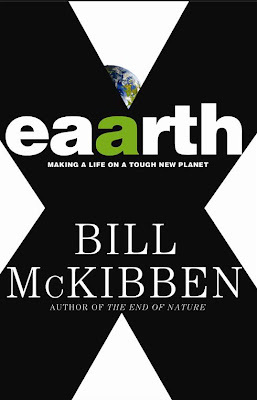 McKibben describes a new Earth: Eaarth with two As. He argues that humankind has so significantly altered the planet and its future that we can no longer assume we are living on the same Earth that we have known. Eaarth begins by describing the environmental impact we have had on our planet and the pretty catastrophic results. In an absolutely terrifying way. Reading this part made me pretty sure we were all going to die in a tsunami. Tomorrow. Luckily, the second half of the book discusses the things we can do. We have passed a point of no return. We cannot go back to our old Earth. We’ve done too much damage already. But by focusing less on the global and more on the local, we can survive on Eaarth with two As. In an interesting intersection of our world’s current issues, Eaarth describes the way that the environment and the economy are intertwined. I don’t believe McKibben is the first to do this, but based on our current economic climate, it is highly relevant. McKibben believes that we cannot grow our economy much more than we already have. That at some point we have are going to have to return to more community-based economies. Farmer’s markets, CSAs, community-based energy, solar panels, and the like are our future on the new Eaarth. You all know that I am pretty liberal in my views (and we have no doubt of McKibben’s liberal leanings after hearing his thoughts on the Bush administration versus the Obama administration) and I tend toward some hippie-ish ways already. I stopped eating meat largely because of the environmental impact of our farming system. I refuse to support bottled water companies because of the environmental impact. But I know I can do more and this book had prompted me to figure out how. I’ve missed my opportunity to join a CSA (our season begins in November here in Florida) but I plan on supporting my local farmer’s market. I can’t help driving my car, but I will find other ways to save energy. I will support my local businesses as much as I can. I hope others read this book and do the same. We all have to do our part if we want to survive on this new Eaarth. I listened to the audio version of this book. Oliver Wyman was a good narrator for this book. He voice is pretty upbeat and it helped temper some of the doom and gloom in the first part of Eaarth. It was also very enjoyable to hear him imitate the politicians quoted in the book. I definitely recommend that audio production. You have me very curious now. I sort of like these types of doom-and-gloom books. Dystopian come to life, if you will. I will be keeping my eye out for this one! That sounds like a very interesting book! I like tha idea of calling our planet Eaarth because we no longer live in the same Earth. I have a question, what’s CSAs?? Community Supported Agriculture. You pay for a “subscription” to a farm and every week you get a share of the crops.